The financial investment a custodial manager makes in a towel and tissue purchase starts before they ever see a single sheet — in the forest itself. Higher costs associated with logging, transportation and processing have made their way to operational bottom lines — many times to a facility's operations manager looking to cut costs and save on overconsumption of paper products. Evaluating dispensing options, in addition to the paper itself, can result in substantial savings in both product and budgetary bottom lines. In addition to paper quality, facility executives must evaluate dispensing when analyzing cost. Any school custodial manager would attest that pulling paper towels can become a fun game for the younger generation. That said, monitoring paper usage can be a bit tricky in a K-12 setting, says Jeannie Murphy, president and owner of Murphy Sanitary Supply in Broken Arrow, Okla., but various dispenser types are available to help. "Sometimes kids think that pulling dispenser lever's are a lot of fun and they can crank out a lot of paper," explains Sid Sowers, vice president of Huber Inc. out of Wichita, Kan. Similar can be said for multifold towels set out on countertops or in pull dispensers. "Patrons grab a handful of towels and then they're never pulled apart," he explains of the traditional folded towels. "They may be less money per case, but facility managers are going through a lot more cases." Distributors comment that for every four cases of folded towels, a facility will need only one of the rolled towels, which come in varying lengths. 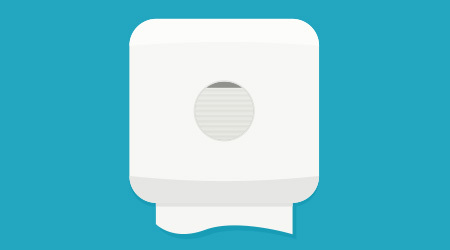 Teresa Farmer, sustainability consultant with Kelsan Inc. in Knoxville, Tenn., adds that "a touch-free roll-towel dispenser not only reduces the amount of product used as compared to a single- or multi-fold towel, but will reduce the potential of cross-contamination." Setting dispensers on timers and designating dispensing lengths will also minimize waste, says Murphy. This portion-controlled dispensing is definitely the most popular option today. In fact, facilities departments have saved substantial budget dollars utilizing this dispensing. "There is definitely a cost savings to controlled usage dispensers," says Tim Maddy, director of operations for Twin Ports Paper and Supply Co. in Duluth, Minn. Of the company's preferred dispenser, he says the units are hands-free, battery-free and offer controlled sheet size. As important as paper guilty and dispensing is in saving facilities money, the ways operational managers purchase can also contribute to the bottom line. Distributors recommend managers buy towel and tissue in bulk. "It's less expensive to do one bulk order," says Murphy, who explains that one invoice and one delivery save both time and money, especially on shipping costs. This is the ideal option for facilities with a set budget and ample storage space. But as the recession continues to keep many custodial budgets in flux, a large number of managers still opt for multiple orders a year. "Managers won't tie up money by purchasing 12 months of supplies at one time," Sowers explains. "We go several times a year now and write up orders." As with anything, the purchase depends on the user, their financial situation and storage capabilities. Maddy says, however, that if departments can buy a variety of products in one bulk order, they should try to do so. "Volume pricing is also based on overall product purchases, not just by how many cases of towel or tissue an end user purchases," he explains. The number one savings tip for any facility, all these professionals agree, is to have a supplier that works with them to discern the various options, and what will work best for each individual situation. "I think managers should have extremely high expectations of their distributors," says Murphy. "My strong recommendation is to use a supplier that has a personal touch, is not just out for the sale, but wants to build a relationship and actually help them make those choices." These professionals will work with facility managers to make sure they get the biggest bang for their buck when it comes to purchasing. Click here to read about how paper weight plays into price. Also, be cautious of cheater rolls when evaluating low-cost paper options. Jennifer Bradley is a freelance writer based in East Troy, Wis.